The first issue of this all-new series includes 24 Hour Room Service and A Creepy Homecoming, both written by Peter David, penciled by Kieron Dwyer, and inked by Tom Sutton, as well as Bloodsuckers by David, penciled by Gene Colan, and inked by Steve Leialoha. Also in this issue: Turn of the Wheel, written by Jo Duffy, penciled by James Fry, and inked by Viscardi. 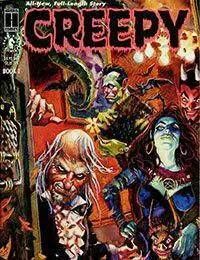 Distributed by Dark Horse Comics, this is the first of the new Creepy stories published under the Harris label. This issue features a cover painting by Dan Brereton.